To tell the story of the Avalon Jazz Band properly, you have to slip back 82 years in time. The year is 1934 and the place is Paris. Guitarist Django Reinhardt meets violinist Stéphane Grapelli. Together they form the legendary Quintette du Hot Club de France, one of the most original, inventive bands ever to exist, the ensemble that gave the world the fluid virtuosity of Gypsy Jazz. 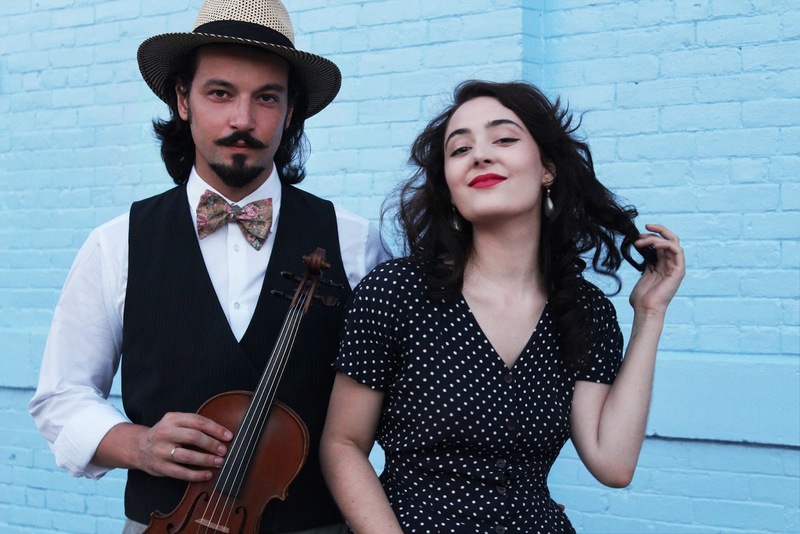 That joyous, elegant music became the inspiration for singer Tatiana Eva-Marie and violinist Adrien Chevalier in founding and perfecting the Avalon Jazz band. 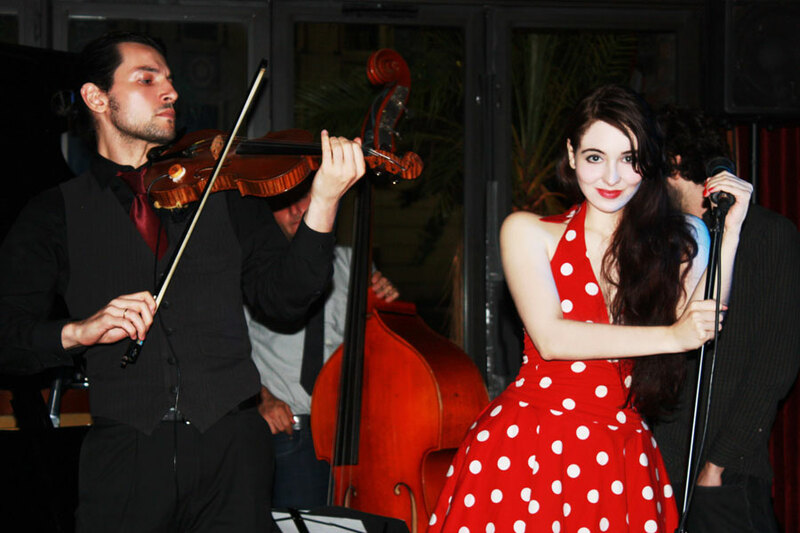 It has quite literally been a long journey across continents for them, from Old World to New, and the remarkable results sparkle on their debut CD, Je Suis Swing. It took a long time to bring together the musicians who could do complete justice to their vision. Je Suis Swing arrives at exactly the right time. Woody Allen’s film Midnight in Paris used Gypsy Swing on the soundtrack and the style is there in so many television ads. It’s become part of the musical landscape. But the Avalon Jazz Band breathe true Gallic authenticity. The album is a mix of older French material like “C’est Si Bon” sprinkled with their take on American jazz standards, such as “I Can’t Give You Anything But Love.” The Old World coming gloriously alive in the New. 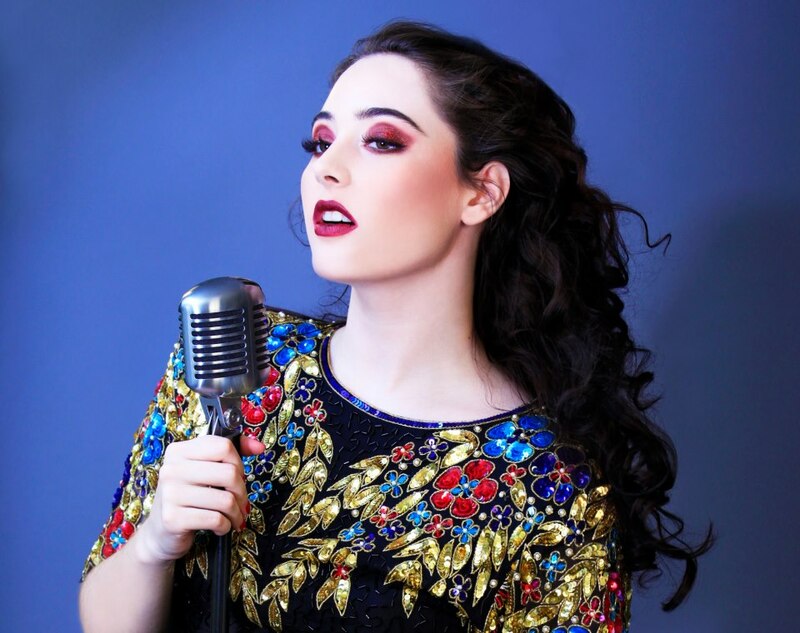 Along with world-class instrumentalists, in Eva-Marie the band has a truly gifted singer, lauded by both the Wall Street Journal (“one of the best young singers around”) and Vanity Fair (“a rising jazz vocalist”). 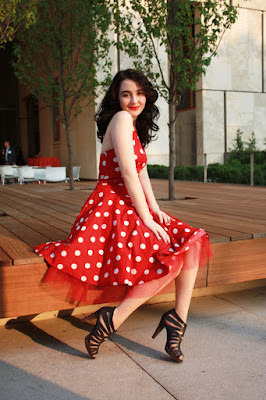 She brings a distinctive, feminine touch to the music. With its daring, thrilling blend of American jazz with the Gypsy music of Reinhardt’s roots, Gypsy Jazz was one of the first East-West musical crossovers, and it set Europe dancing in the 1930s. For Eva-Marie, with a Francophone father and an Eastern European mother, it’s the music of her blood, as natural as breathing. But Je Suis Swing is also Eva-Marie’s and Chevalier’s homage to the zazous, the French youth who dared to oppose the Nazis with fashion and outrage. “I’m fascinated by them,” Eva-Marie says. “They were young people who protested the war and the occupation through insolent joy. They used music and fashion as their weapons and they’d do ridiculous things like carry an umbrella even when it wasn’t raining. Fabric was rationed, but the men would wear big, massive suits. It was their way of fighting back, of saying they were young and alive. For the virtuoso Chevalier – the third generation to play violin in his family – the Gypsy Jazz that the Avalon Jazz Band plays offers something he never found in all his years of classical training. This debut CD has been a long time coming. Even after they had the right musicians to create the sound in their hearts, they spent a long time touring and honing their arrangements across America and Europe, even in the Caribbean. Their YouTube channel draws plenty of visitors from South America and Japan, places they haven’t visited. The album’s release will be celebrated with a party at Iridium in New York, a venue the band plays regularly, on September 6. The Avalon Jazz Band. They are swing. Tatiana Eva-Marie was born into a family of professional musicians and quickly became obsessed with her father’s extensive jazz record collection, while also fascinated with the musical world of her Romanian mother. Tatiana started her career as a singer at age 4 when she recorded an album of duets with famous children’s performer Henri Dès. Two years later, she recorded her first solo album and performed in her first professional theatre play. She fell in love with the stage and has been performing ever since. During her childhood, she performed regularly in various stage productions including guest star appearances in her father’s band The Cotton Club Jazz Orchestra. At age 11, she started her professional training at the Theatre Populaire Romand acting school in Switzerland, and then a few years later, at the American Academy of Dramatic Arts in New York City. At 16 years old, she moved to Paris, where she studied medieval poetry at the Sorbonne University during the day, and performed as an actress and Gypsy singer in some of the most renowned cabarets and theaters in France, including the Comedie Francaise. In 2011, Tatiana moved to New York City, where she founded the Avalon Jazz Band and quickly set her American career in motion. She was recently acclaimed by the Wall Street Journal as “one of the best young singers around” and included in Vanity Fair’s list of rising jazz stars, alongside Cyrille Aimée, Jon Batiste and Cécile McLorin Salvant. 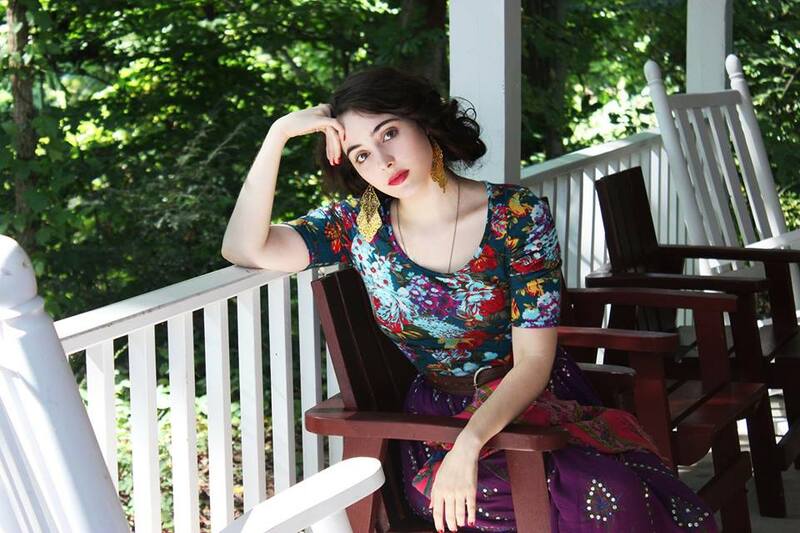 Tatiana’s style is a direct tribute to her musical childhood, a mixture of her father’s Francophile jazzy influence and her mother’s Balkan heritage, through which she expresses her passion for poetry, rhythm, swing and the bohemian lifestyle. Adrien Chevalier: Born in Provence, South of France, into a family of violinists, Adrien Chevalier began his musical education at the Avignon Classical Conservatory, where he studied for 12 years before moving to Paris: there he developed his passion for Gypsy jazz and Eastern European music. He created Pad Brapad, a musical ensemble specializing in Balkan folklore, with whom he performed all over Europe, participating in the most renowned Word Music festivals. Adrien Chevalier then settled down in the French capital and joined the Grüss Circus orchestra, while also studying at the CMDL jazz school with master violinist Didier Lockwood. Hiss artistic collaboration with Tatiana Eva-Marie inspired him to move to New York City where he co-founded the Avalon Jazz Band with her. Adrien Chevalier continued his work as a film composer (Canal +, France 3…) and founded the Hot Club of New York with whom he performed at the New York Hot Jazz Festival in 2014. Adrien Chevalier often collaborates with renowned Gypsy jazz artists such as Stéphane Wrembel and Olli Soikkeli. 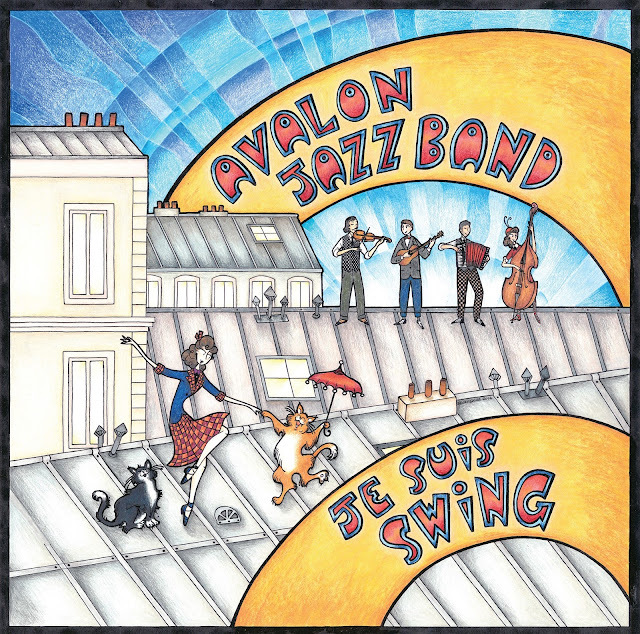 The musical style presented by Avalon Jazz Band is inspired by the sort of jazz played in Paris in the 1930s and 40s, especially by the Hot Club de France, founded by Django Reinhardt and Stéphane Grappelli, whose repertoire consisted of original music and jazz standards. This style of hot jazz then became what we now know as « Gypsy jazz » or « Jazz Manouche », with its technical bravadoes and virtuoso skills, embodied by the quick fingers of Adrien Chevalier. 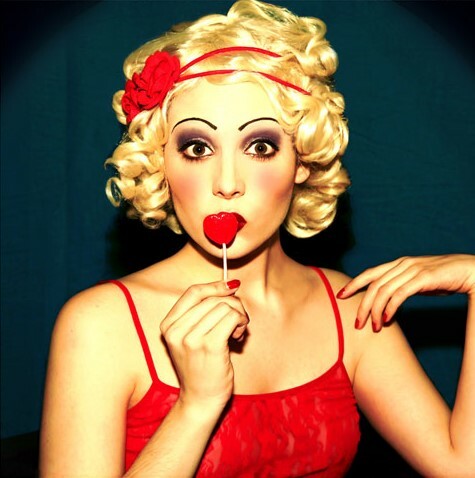 The delicate voice and swing phrasing of Tatiana Eva-Marie brings the zazou element to the mix: an ingenuous and mischievous joie-de-vivre, which she incarnates to perfection. The zazous were young Parisians obsessed with American swing: their way of rebelling against the war was through dance and jazz (a forbidden music during the German occupation), displaying a very insolent kind of joy, which caused them to be marginalized and persecuted. The influence of the Russian aristocracy’s diaspora to France after the Russian Revolution and of the Jews fleeing Eastern Europe right before WWII, can be felt in the French compositions of time. This element is also present in the music of Avalon Jazz Band, with a sound palette of Gypsy, Klezmer and Balkan inspiration. The vocal repertoire of Avalon Jazz Band comprises jazz standards and French songs made popular by Yves Montand, Jean Sablon, Juliette Gréco and Charles Trenet, among others. The instrumental repertoire comprises original compositions and music by Django Reinhardt and Stéphane Grappelli. ‘Mu’ is often translated as “nothingness,” but as the response in Zen’s most famous koan, the gesture speaks to a truth deeper than rational dualistic thinking can obtaintherefore also resonating with the creative mindset accompanying the purest forms of musical improvisation. The music created by French guitar iconoclast and electronic music pioneer Richard Pinhas and insistently inventive San Francisco Bay Area guitarist Barry Cleveland on Mu originated in just such a way, arising seemingly from “nothingness.” The two had contemplated performing as well as recording together for several years before their stars finally aligned during Pinhas’ 2013 North American Tour. The guitarists played several Bay Area shows as a duo and invited two other musicians to join them for a studio session lasting less than four hours. Mu, the remarkable document stemming from this brief yet profoundly potent studio encounter, is slated for release on Cuneiform Records on Sept. 16, 2016. Unfettered by genre conventions, Mu is a mesmerizing combination of entirely improvised music and Cleveland’s post-production compositional development. The four long pieces unfurl as a confluence of overlapping musical currents informed by art rock, ambient, electronic, avant-garde jazz, and various “world” music inflections. 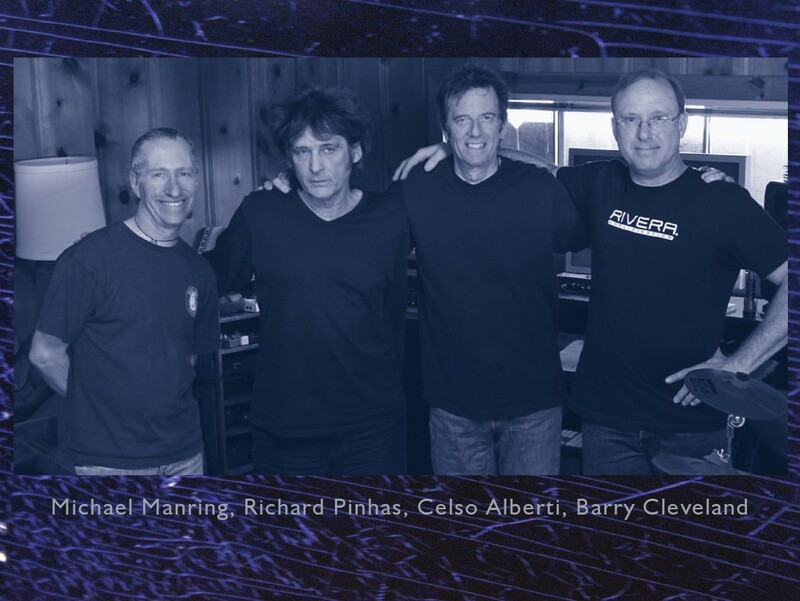 Joined by two longtime Cleveland collaboratorselectric bass innovator Michael Manring and Brazilian-born drum master Celso Albertithese expansive and timeless soundscapes feel unlike anything created before them. “My production and mixing fingerprints are all over Mu, and may even be evident to those familiar with my other recordings,” Cleveland says. “But the essential character of the music is the result of four unique musicians improvising together on a particular day, at a particular time, and the creative possibilities and energies available to them in that moment.” It’s the kind of confidently interactive invention that can only take place with deeply connected musicians. While not originally intended as a suite, Mu is effectively an audio odyssey that flows naturally from beginning to end. Mu opens with the darkly cinematic “Forgotten Man.” It’s the only track without Manring and Alberti, but Cleveland’s programmed percussion keeps the mysterious gentleman on the move, wending his way across churning synthesizer landscapes driven by the polyrhythmic pulse of tribal drumming and ever-shifting permutations of the soaring melody. The album’s 26-minute centerpiece, “I Wish I Could Talk In Technicolor,” seduces the listener into an enigmatic and at times unsettling world of strange new sounds and tonal colorations that are in turns intimate and orchestral in scope. One moment an alluring soundscape propelled by hypnotic kalimba rhythms and Pinhas’ pulsating guitar loops; the next exotic atmospherics hovering atop Manring’s elastic bass figures and Alberti’s rapid-fire electronic kit work; the next full immersion in trippy textures infused with sitar guitar; and the next a spacy art-rock excursion featuring Pinhas’ multidimensional droning and Cleveland’s bowed guitar layering, dynamic looping, and fuzz-drenched soloing. “Zen/Unzen” uncoils gradually like a sonic Slinky, continually generating fresh kinetic waves. An evocative Pinhas’ guitar loop becomes suffused with coruscating Moog Guitar textures, before Manring and Alberti emerge into the foreground and establish an Afro-tinged groove with uncommon power and authority. Jon Hassell-inspired melodies executed on a toy woodwind synth and jazzy faux trumpet MIDI guitar lines push the piece into world-fusion territory, while runaway Echoplex sounds nod in the direction of electric Miles. The gorgeous closer, “Parting Waves,” blends moody loops and brooding EBow bass with cascading 12-string guitar clusters and a majestic yet mournful melody that swells and then subsides before gradually merging into the sound of breaking waves punctuated by the cries of distant gulls. 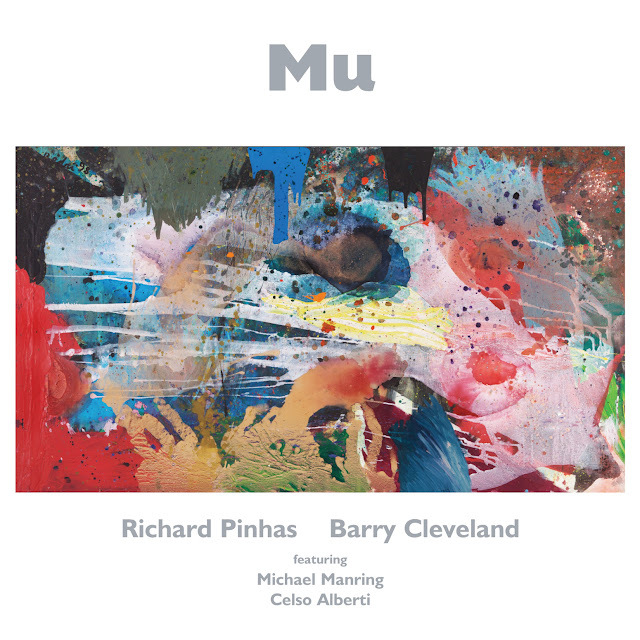 Mu, the first Richard Pinhas / Barry Cleveland collaboration to be released by Cuneiform, should appeal to fans of such artists as Jon Hassell, Arve Henriksen, Nils Petter Molvær, Bill Laswell, David Torn, Brian Eno, David Sylvian, and David Bowie. 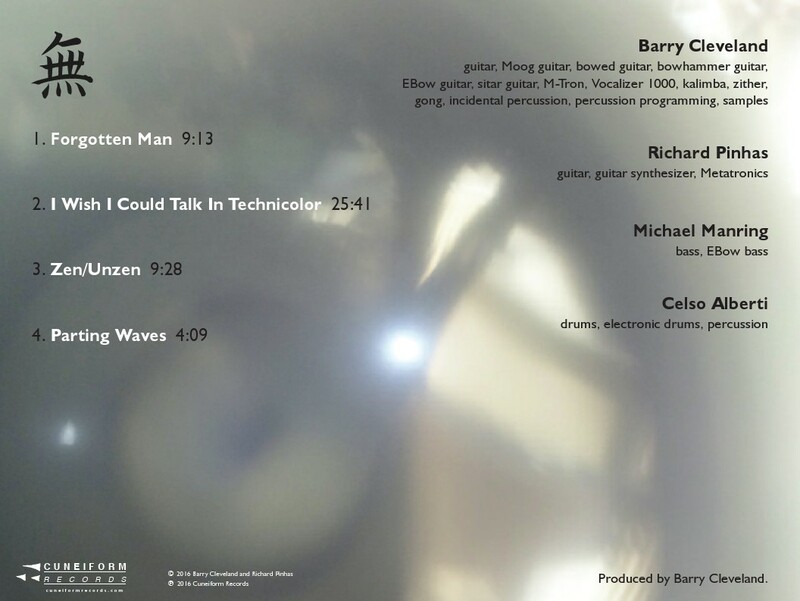 All compositions by Richard Pinhas and Barry Cleveland. 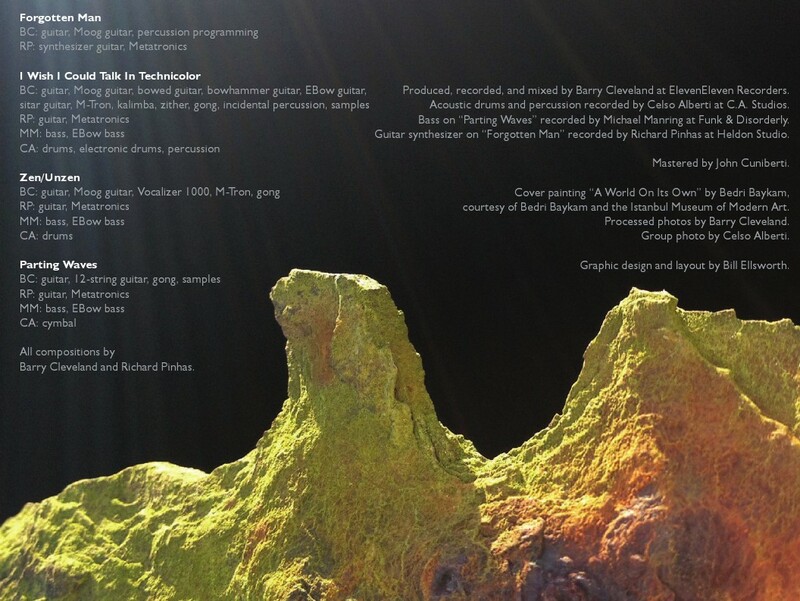 Produced, recorded, and mixed by Barry Cleveland at ElevenEleven Recorders. 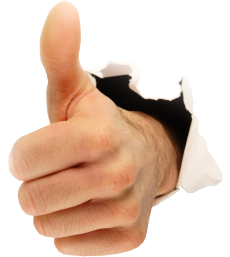 Acoustic drums and percussion recorded by Celso Alberti at C.A. Studios. Bass on “Parting Waves” recorded by Michael Manring at Funk & Disorderly. Guitar synthesizer on “Forgotten Man” recorded by Richard Pinhas at Heldon Studio. Cover painting “A World On Its Own” by Bedri Baykam. Courtesy of Bedri Baykam and the Istanbul Museum of Modern Art. Processed photos by Barry Cleveland. Group photo by Celso Alberti. Graphic design and layout by Bill Ellsworth.